It’s time to stop trading time for money. Over the course of the next three episodes, I’m going to teach you how to do Value-Based Pricing. For this series, I have a special guest, Justin Michael, with me on the show. 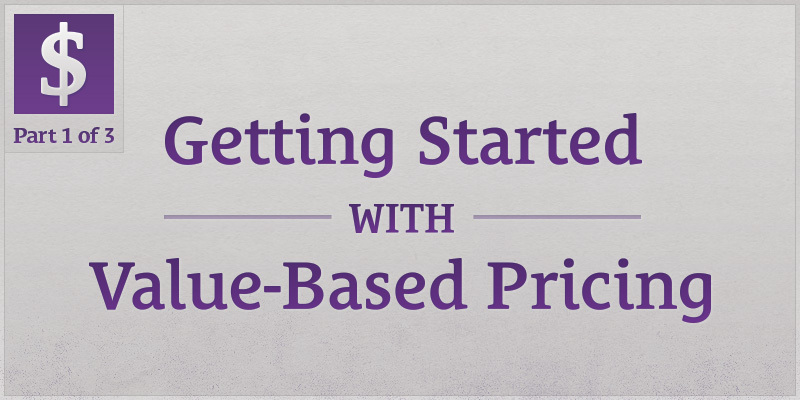 In this episode, we break down 5 steps to getting started with Value-Based Pricing. We take you behind the scenes on huge project we just finished. Justin is a developer. We’ve been working together for half a year on different apps and features for the Community. Most recently, we completed seanwes talk: a completely custom chat system that’s a hybrid between real-time chat and long-time archivable content. When I first approached Justin with this project, I didn’t know how much this would cost. I initially had a figure of $20,000 in mind. When Justin came back with a quote for nearly $50,000, I was a bit surprised—that is, until he explained. Once I understood, I happily wired him the initial payment even though the quote was more than twice what I was anticipating. What was it that made me spend $30,000 more than what I expected? That’s the power of Value-Based Pricing. In the next three episodes, I’m going to break down this process for you. If you’ll lend me your ear and attention, it’ll be more valuable than any college course you ever took. 02:09 Sean: Justin joined the Community last year and at the time, we only had a simply plugin for the chat. Justin set it up where you could use Fluid App on the Mac operating system so the chat could be a standalone application and he wrote some CSS to make it look nice. He took the initiative to make what he saw better when I hadn’t even asked for it. We got to talking and ended up working together to build the current iOS app for the seanwes Community. 03:22 Justin: When I first joined the Community, I was in the forums and I saw these great posts, content, and people, then I discovered the chat. It was only on the website so it wasn’t very convenient. I thought it would be great to turn it into a standalone Mac app. I posted about it and shared the CSS I wrote and people really liked it. We started working on the iOS app and that came out really well given the limitations we had with the old chat plugin. Then, I was really excited to work on seanwes talk for you. It’s a really big project—I’m still working on some aspects of it—but it’s really nice because it’s something I personally use ever day. I’m able to improve it with the instant feedback I get from the Community and from you. 04:30 Sean: The old chat plugin was so bad that if we had more than 20 people tuning in to the live stream, it would bring the whole site down. It couldn’t handle the volume and at that point we were growing pretty fast. We weren’t anywhere near the level we are now—we’ve had 100 new members in the past month. We weren’t even growing at this level half a year ago but I knew the plugin couldn’t accommodate the growth that we’re anticipating. Before we talked about rebuilding the whole chat system from the ground up, I really needed an iOS app. 05:22 I needed the ability for people to hop on the chat from their phones and be able to listen to the stream. All Justin had to work with was a terrible chat system and yet he was able to turn it into an incredible experience. I was really impressed with what you were able to come up with given the limitations. That’s was what showed me how good you were and how dedicated to quality and user experience you were. That relatively small project gave me the confidence to hire you for something bigger. 06:11 Justin: My favorite thing is to create something that has little details and subtle touches that most people never even notice. When people do take note of them and they say, “Clicking on that blue bar at the bottom scrolls me down to the bottom of the chat—that’s such a natural interaction and it’s really great,” that’s what I live for. Apple does a lot of that. They go out of their way to find out how people are going to use their product, what will be intuitive for them, and where they can decrease friction to make the experience awesome. That’s what I strive to do in every project I work on. 08:49 seanwes talk is the new chat system in the Community. I want to tell you the behind the scenes story of seanwes talk because it’s hard to find real numbers when you research this kind of thing online. A lot of people aren’t willing to disclose details but I want to break down the whole story and show you real numbers. How else are you going to learn? I want to use this example to show you how Value-Based Pricing can work in action. The key to Value-Based Pricing is focusing on solving problems. 11:02 Justin: Focusing on solving problems is how I approached this. When you came to me, you needed a new chat system and my first question was, “Why? What problem are you trying to solve?” The existing chat was slow and that’s a valid problem, but I tried to dig deeper than that. I wanted to check out some alternatives like existing chat solutions—Slack, Hip Chat, IRC—things we could adapt to meet your needs. It became apparent pretty quickly that in order to solve the problems and to achieve your goals, we would need to build something from scratch. 12:12 The Community environment required too much custom stuff for those solutions. People in the old chat were constantly saying they wished the chat did this or that. It was nice to be in the Community and absorb all that feedback passively, over time, and I tried to take all that into account. We talked about the Community’s desires, Sean’s desires, goals, short-term plans, and long-term plans so that I could come up with the best solution to all of it. The Community’s desires didn’t always mesh with Sean’s long-term plans, so it was important to find an innovative solution that resolved those contradictory desires. 13:32 Sean: You mentioned that you were in the chat regular and engaging with people and absorbing a lot of feedback passively. That was a really big factor for me in choosing to hire you. You had used the chat for several months at that point. You joined the Community of your own volition—you were there because you wanted to be there and that played a huge role in me coming to you for a solution in this case. You’re motivated to make a great experience because you’re actually using it! It wasn’t something where we said, “We’ve observed this hole in the market and we want to capitalize on that.” We built it for a problem we needed to solve and around the needs of the Community we had observed over the better part of last year. People wanted to be able to read the backlog—what had been written since they lasted visited the chat—but the problem with the old chat was it only kept a certain amount of messages, then they would just fall off. 15:15 Justin: Early on, when those problems would come up with the old chat plug in, I jumped into the code—which wasn’t written for efficiency and it was out of date—to reduce the number of messages the backlog would spew out. That was such a bad compromise to make but it was either that or there wouldn’t be a chat. There were tough decisions to make and horrible constraints to be under with the old chat. 16:26 Sean: It got to the point where people would copy and paste conversations and trade those clips amongst each other just to be able to read the backlog. We do have thousands of posts in the forums but people really liked the live interaction—they want to be where the party is. Life-changing discussions were happening in the chat and it would disappear forever! We needed a hybrid between real-time interaction and archivable abilities to save those great discussions. We uncovered those needs by using the old chat. I went to you needing something stable but also wanting some cool features that would make the Community experience great. 18:05 Justin: The backlog issue was huge. Now, there’s an infinite backlog where everything is saved to a database. There’s badges on the avatars now to indicate when people are scrolling through the backlog too. 18:20 Sean: That was so cool because people were trying to figure out how to do that with the old chat. They would change their name to have a little emoji at the end to indicate they were scrolled in the backlog, reading. Otherwise, people would come in and say hi to you and ask things but you wouldn’t see it. The badges were an awesome feature. 18:53 Justin: That’s a fantastic example of a feature driven by observing the way people use the existing system. People will find ways to hack around a system that doesn’t do what they exactly want by using those little tweaks—that stuff is gold! If you get the chance to rewrite that system or augment it, you can take that feedback and incorporate it not only in a basic way, but by taking it a step further and implementing it in a way that makes them go, “Wow, that’s great!” No one has to do anything for the backlog indicators to come on—they just scroll up and it happens. 19:48 Sean: It would be really easy for someone who wanted this chat system built to just tell the developer to make a “backlogging” option that people could toggle. If I had said that, it wouldn’t have given birth to this completely intuitive solution that you came up with. 20:27 Justin: The reason we have that feature is because I was focused on the value—the value to you and the value to the Community. You have to be in a value-focused mindset to create great things like this. It’s not, “Well, my client said to make a toggle so I guess I’ll do that.” No! Why did they ask for the toggle? What are we trying to solve with this? Is there a better way to solve it? What’s the best way to solve this problem? That’s how you get to incredible features like that—big or small. You have to be focused on the value. 21:38 Sean: I envisioned this glorious new chat system that we now call seanwes talk. I did’t know what it would look like, but I was imagining all of these problems solved. That was a really important part of this arrangement—I’m a designer and I can tell you how I think a user interface should work since that’s my background but that’s not my place in this arrangement. Hiring you means you are the professional and I am the client. As the client, I’m responsible for content and goals. We talked about the problems we needed to solve along the way. I intentionally walked into this situation not envisioning what it would look like or how it should work. I wanted to focus on the problems we wanted solved. Not every client is going to be in that position and even I wasn’t exactly focused on problems to solve in the early stages of this project. I was feeling the pain of the old chat being slow and needing a new one. Setting the stage for a value-based price is focusing the client on the problems, not on what the client thinks the solutions should look like. 23:26 Justin: Clients come to you because they’ve gone through the internal process of realizing they have a problem. They ask themselves if they can solve the problem on their own and the answer is no, for whatever reason—they may not have the experience, capacity, or skills. Then they start looking for someone else to hire to solve it. Through this process, they naturally start to form this idea in their minds of what the solution looks like because they’re very familiar with their problem. When they finally come to you, they have this notion of what the solution is and they want you to make it happen. That’s usually a bad thing—they’re coming to you because they can’t solve this problem on their own but they have an idea of how to solve it. You have the experience and skills needed to solve it, that’s why they’re coming to you in the first place. 24:45 You’re in a better position to examine their problem and come up with a better solution than the one they have in mind. That’s one of the keys to the value-focused mindset. You can’t have a client come to you and tell you how to solve their problem. That’s probably not the best way to solve it and that’s not how the client is going to get the maximum value out of your expertise. You need to ask them questions and ask, “Why?” until you get to the nugget of the problem and then you need to figure out how to solve it in the best way possible. 25:38 Sean: We didn’t know the full scope of this project at the beginning. It was a 2-month process from when I came to you to when you got paid and started working. 25:57 Justin: At the beginning, I had no idea what it would turn into. You have to be open to anything because at the beginning you don’t know anything. You know what they’ve told you but you may not know anything until you start having conversations and asking the right questions. The solution could have been anything from me helping you transition from a Slack account to custom writing it completely from scratch, like we did. Whatever solves the client’s problem in the best way—that’s what you’re after. 26:42 Sean: It’s worth noting you were willing to implement any of those other solutions—IRC or any third party solution. It wasn’t like you were set on the custom solution where you could make the most money. You were focused on providing the most value you could to me as the client. As far as things like timeline, we’ve been working on this project for close to half a year. I honestly didn’t know what it would end up looking like and how long it would take but now I’m super excited about it. One of the awesome features of it is you can star or favorite messages. The star glows and has a number next to it so you can see how many people have favorited it. That’s so cool because when you’re backlogging, maybe you don’t want to read through all of the messages but you can look at the star column to see what the really good messages are. 28:17 We won’t go into all the features but there’s some incredible ones—origin time stamps, where everyone can see when a message was sent in their local time, a dark-mode theme, and eventually messages will be able to be linked to directly. And that says nothing for the beautiful visuals of it! Neither of us had ever done anything quite like this so I wondered what I would end up spending on this. I had nothing to go off of, except an idea in my mind. I knew it would take a lot of custom work and time. The subjective number that came to mind was $20,000. I bring it up because that number is what clients will give you when you ask them what their budget is. If you ask the client what their budget is up front, it immediately focuses the project on money (not what you want). 30:15 The message it communicates is , “What can I make off of this client?” If Justin had come to me and asked for a budget so he could make the system that I exactly had in mind, he would have priced the project according to the budget number I gave and as the client, I’ll see that as an expense. An expense is something I have to pay for to get a problem solved and I want to keep expenses down. People try to keep down expenses, whereas people try to maximize their return on investments. As a professional, you have to position yourself as an investment to your client, as opposed to an expense. When you ask for a budget up front, you’re positioning yourself as an expense. 31:20 You’re saying, “I’m something that costs money and you want to keep down,” not, “I want to be on your team and maximize your return on this investment. I want to make sure you get a lot of value out of this.” Justin didn’t ask me for my budget, I’m sharing this to help you get into the client’s mindset. It introduces an artificial constraint for the professional. It closes doors in the clients’ minds. 32:07 For the professional, it feels like you have to stay within the dollar amount the client gave you but the reality is: you don’t. If they give you a dollar amount and a rough idea of what the solution is, then the budget is based on that. When you start talking about the problem and the best ways to solve it, the budget can change. Going in with that artificial constraint in the beginning closes doors that could open through out the process. If the client formulates a number in their mind, that’s going to close doors in their minds as well. Once they have that number in their mind, it’s hard to make them go up from it so it’s best to focus on their problems and the possible solutions. Have a conversation without worrying about a budget too early into the process. 33:23 Sean: Christina, in the chat room, says, “I’ve always used the budget question as a way of realizing the client isn’t even worth having a conversation with. I don’t even follow up with the project information if they say they only have $50.” Budgets might filter out $50 clients so you can get $150 clients, but they’re not going to get you the really good clients. If you’re in Scarcity Mindset and you think $150 is a lot of money, then budgets can filter the $50 clients out. But by not asking the budget question and positioning yourself as someone who consults with the client on the right problems to solve, that can be the difference of thousands, or tens of thousands, of dollars. Justin, can you take us into the pricing behind this project? 34:15 Justin: We’ll talk more about how to come up with the price to give the client in the third installment of this series. After our 2 months of extensive conversations and number crunching on my part, I came back to you with a quote that was a little bit over $48,000. 34:50 Sean: Well over twice the number I had in my mind, which was the largest amount I had ever spent on a project. 35:01 Justin: Yeah, and I had no idea what number you had in mind. I didn’t ask for it and you didn’t volunteer it. My number was based on the discussions we had and what I was planning to build after all of that information gathering. 35:27 Sean: It’s a rare instance that you’re able to listen to a podcast where someone who is executing Value-Based Pricing talks about it with the person they did it with and you get to hear inside the client’s mind, who also happens to be a professional. Many people know about the success of my Learn Lettering launch, where I made 6 figures in 3 days, and it continues to do well but at this point, I didn’t have 6 figures in my bank. I had a decent amount of money but I was investing a bunch of the launch money back into my business—website development, a new Mac Pro, and camera gear. I wasn’t rolling it in when we were talking about dropping $50,000 on a project—that was significant for me. I had this $20,000 figure in my mind and I took 2 days to mentally process the quote. It was more than I thought but it was also about more than just solving the short-term chat problem, which Justin helped me realize in our 2 month conversation on this. You can’t expect to charge really good rates on the work you do if you aren’t solving really good problems. 37:25 If you’re taking the client’s demands at face value, you’re not going to be able to command the kind of rates that acknowledge the value you’re creating. Let’s say I didn’t hire him and I wasn’t ready to pull the trigger on a new chat system: fast-forward 4 months and the number of people that would be in the chat perpetually—regardless of whether there was a live stream—would be above the amount of people it took to crash the whole site. It would get to the point where people were joining and they were walking in on a chat that was crashing because it couldn’t handle the load. If I let it get worse and then went back to Justin, he could have had other projects and no availability to start for a month, then it would take 4 months to complete after that. I would have essentially run the Community into the ground from short-sightedness. To avoid this happening, I had to think in terms of what this would be solving for the future. Justin asked me the right questions and helped me focus more on the long-term. 38:56 Justin: I wanted to focus on long-term viability and long-term stability. You planned to have this Community for a very long time into the future and I didn’t want to build something that would need to be rewritten in 2 or 3 years. I want it to last because that’s how best to solve your problem. Again, it’s all about focusing in on how best I can solve my client’s problem. Hacking something together that was designed ok, but not great, isn’t the best way to solve any problem. I asked you a ton of questions like, “Where do you see the Community a year from now? 3 years from now? 10 years from now?” That informed me of how robust this project should be and how much attention to detail should be put in. It’s a difficult and lengthy process to take all of these factors and weigh them against each other, but it’s very much worth it because it results in great outcomes like your project. You had $20,000 in mind and I quoted you $50,000—I’m curious to hear what your reaction was to it when we launched the beta. Did you feel like you got your money’s worth out of it? 41:01 Sean: I immediately felt like I got my money’s worth. My response was that it exuded quality—thats the best way to describe it. I came into it expecting you to solve the problems you said you would solve in the best way you know possible, so I went into it without any expectations of my own. When you started explaining the system and the decisions behind it, I was able to see how you arrived at the solutions you did. You explained why you made those decisions and why they worked to solve the problems I had. In a lot of places, it solved the problem in a way I didn’t expect and probably in ways you didn’t expect, because the problem defined it’s own solution. What we needed to accomplish necessitated executing it a certain way given the technical limitations we had. 42:16 Justin: Dale Campbell, in the chat room, asks, “Did you go 2 months without any kind of income, or did you have other projects happening simultaneously that allowed you to take that sort of time?” At the time, Sean was not my only client. He’s still not my only client, although he is the biggest one right now. I had other sources of income during that time. One of the things about Value-Based Pricing is that it allows you to charge enough money so you can focus and spend a lot of time on solving problems effectively. 42:57 When you charge by the hour, it’s a constant race to keep your income at a level where you can sustain your bills. Value-Based Pricing is a shift into charging based on value and accepting only clients and projects that fit within your situation. That way you can have a large project, money-wise, that will sustain you for the duration of the project and a little while after. It allows you to put in that discovery time and resources into the conversation with your next client about the next project. It was also a 50% payment up front and 50% payment at launch agreement with Sean’s project. 44:01 Sean: We had even talked about splitting that up further to where the second part could be paid as 25% + 25%. If the project is long enough to where 50% up front doesn’t cover your needs during that time, you could break it up further. I wanted to pivot the discussion to the benefits of Value-Based Pricing—making more money because of Value-Based Pricing is more of a side effect. Value-Based Pricing is about creating an environment that lets you do the best work you’ve ever done and solve problems in the best way possible. 45:13 Justin: You look at the needs your clients have and you ask yourself, “What’s the value to them if I solve this problem well?” Then you can charge a fraction of that and everybody wins. You have enough money to allow yourself to focus entirely on fixing the problem in the best way possible and the client will get tremendous value out of the exceptional work you’re doing because you’re not running around with a dozen different clients. You’re not working hourly rates and trying to work more hours each day just to make ends meet. It frees you from the cognitive burdens of tracking your time and thinking about your projects during non-work hours. 46:35 Sean: It’s solving problems over doing tasks. 46:39 Justin: Exactly. It gives so much freedom that way. I can’t overstate the value of sweeping that unnecessary stuff away and just focusing on your work. You want to be paid enough to where you’re not even thinking about money. 47:02 Sean: Think about that! When you’re working on your projects, are you thinking about money? If you’re thinking about money, then you’re not getting paid enough. You need to be paid enough to where you don’t have to worry about money and you can focus on doing your best work. That’s the kind of freedom we’re talking about. When you do the work up front to discover the right problems to solve and the kind of value you can provide for the client, you’re able to price in a way that makes sense to the client because of the value they’ll be receiving, but it also makes sense for you. We want to give you 5 steps to starting with Value-Based Pricing. 48:11 Sean: Hourly pricing puts the focus on minimizing expenses, while Value-Based Pricing puts an emphasis on maximizing returns. When you’re billing by the hour, you’re saying, “What can the client pay me?” When you’re pricing off of value you’re saying, “How much value can I generate for the client?” A lot of people might be thinking that Value-Based pricing is a scam to get a bunch of money from the client and exploit them, but it’s the opposite. 49:04 Value-Based Pricing always starts with the client, not you. You’re not trying to exploit the client for your own gains, you’re starting with generating value for the client. This is why many projects must be turned down. If there’s no value to the client, there is no project. If Value-Based Pricing was exploitative, we would be attempting to get money from the client no matter what—regardless of whether there was value to them in completing the project. 49:44 Nothing we do as professionals exists in isolation for our clients. In fact, nothing you do as a technician—doing tasks instead of solving problems—exists in isolation for your clients. Professionals consider context—they think about everything outside and around the project they’re working on. They work to solve the right problems. In order to know what the right problems are, you have to learn the context around the project. It’s the professional’s responsibility to determine the viability of a project. Value is not divisible by the hour. 50:25 Justin: Charging hourly isn’t compatible with the value-focused mindset because value is not divisible by the hour. Tasks and following specific directions are divisible by the hour. 50:55 Sean: You have to determine if the project is viable. If it’s not something the client will get value from, then you want to turn down the project. This isn’t about getting more money from people, it’s about acknowledging the value you’re creating for your client and pricing accordingly. The client has to be able to afford the project. The value has to be high enough to justify your working on the project. 51:47 If Sean had come to me after I gave the quote of $50,000 and said, “I’ve only got $5,000 to spend on this project,” or, “I can’t justify spending that on the value of this project,” then it would be about lowering the value delivered, not charging less for the same value. If this project had been funded with half the amount of money, there would be half the features, value, and results. 52:39 Sean: Your job at that point would be to determine if it’s even worth doing at all. If you did the project and it was a crippled, half version of it, you wouldn’t want to just take the client’s money. At some point you might need to say, “The problems you’re trying to solve are critical to your business. It’s important you address these things instead of half-solving them because doing that will do more damage in the long-run.” Part of being a responsible professional is turning those kind of projects down—even when it means making money. 53:18 Justin: It’s not just damaging to the client, it’s damaging to you, as the professional too. You’re going to do work that’s of lower quality and it’s going to go out into the world. When people see that work with your name attached to it, it’s going to decrease your reputation and credibility. 54:35 There’s a little bit of the reducing risk factor with my case. Adding the new chat will increase revenue over the next several years but more importantly for me, it’s reducing risk. If I had kept the old chat and we continued to grow at the rate we did, it would be a disaster. That’s value you’re bringing me that I can’t see by just looking at revenue, but I can imagine it when I think of all that revenue going away. 55:10 Justin: We talked about a lot of different features for the chat and there are things I simply didn’t do because it didn’t make sense for where you are now. There is stuff still on the drawing board for later though. It’s ok for some of these solutions to wait until it makes sense. You can’t say yes to moving forward with projects just because you can, you have to stop and think if you should. How is this going to effect the risk? How is this going to effect the longer-term situation for yourself and your client? 56:15 Sean: When you bill hourly—trading time for money—it opens you up to comparison on rate. It doesn’t matter if you can provide a better solution to the client. They don’t know that because you didn’t position the conversation that way. You positioned yourself as a commodity, so you must compete on commodity. This means the client will look for a lower price. Also, raising hourly rates is difficult because it feels arbitrary to the client. How quantifiable is the notion that you’ve “gotten better” since you set your original rate? To the client, it just looks like an expense went up. 57:41 Think about anything you pay on a recurring basis at a set rate—like internet, phone, or web hosting. Imagine you get what seems like nothing different but all of a sudden, the rate goes up. Maybe they slowly, over time, have added a few features and things have gotten better but on your end, nothing looks different. You’ll think your expenses are just going up. That’s essentially what raising an hourly rate will be like when you approach a client that you’ve been working with at a set rate. The problem is, when you go to increase that rate, they now feel like they’re pouring more money down the drain, not that they’re getting value out of this. When you detach yourself from selling time and instead sell value, the client will always be on board. 58:42 They’re going to spend money to make money. Of course they’ll spend $1,000 now to get $10,000 later. 58:50 Justin: Hourly pricing also means regularly invoicing them and that invoice is a reminder that you’re a drain on their resources. That tends to have you perceived as a drain instead of an asset. It’s so easy for people to compare hourly rates at face value without thinking about the value or people behind it. It’s easy for them to compare with your competitors, your past hourly rates, and the industry standard hourly rates. A lot of clients like having a large fixed price vs. an hourly rate times a range of hours you think you can do the job in. 1:00:08 Sean: Who knows how long that will take? If I work slow, you pay me more. 1:00:13 Justin: Exactly. Clients generally like the certainty of basing price on value vs. a large hourly range. 1:01:43 That’s how the client sees you. It’s a monumental jump to the investment category from the expense category. In most cases, you can’t. That will mean you can’t work with the client under those terms anymore. You’ll have to position yourself as an investment to future clients, which sometimes means using the Overlap Technique—covering your expenses with another source of income—so you don’t get into Scarcity Mindset and try to take whatever projects you can get while charging cheap rates. You’ll have to stick to your guns and position yourself as someone who can create value for your clients. This means saying no to a lot of people and saying no to more clients than you’re saying yes to. 1:02:43 Justin: The other thing thing about your existing clients is that it’s not entirely about money. The whole structure of your relationship with those clients has been built around a commodity, hourly-based rate situation and that would need to totally change. It’s very different when you’re focused on value and it’s difficult to change all of that on top of charging them more. It probably won’t work. Won’t Other People Just Charge Less? 1:03:26 Sean: There will always be someone charging less. It’s a race to the bottom and you have to decide which court you want to play in. You have to position yourself differently than a commodity if you expect to be paid as a professional. By focusing the conversation on value, you position yourself as a consultant rather than a technician. 1:04:08 You have to be able to convey the unique value that you are able to provide and back that up with a proven track record. Why is this client coming to you anyway? You should know that. You should have discerned, based on the preliminary questions you asked, if this is a good project. You need to know why that client is coming to you. You need to know they’re coming to you for your expertise. Look at the way they fill out the quote request and the way they talk. Are they asking you to perform tasks or are they coming to you with problems and seeking a solution? Part of it is the questions you’re asking but it’s also about the way you position yourself on your site—having case studies. 1:05:04 Ideally, they’re coming to you for a specific reason—likely having to do with your existing portfolio and case studies. The client is able to put themselves in that story. If you’re not writing about it, why should clients come to you to solve problems? They’re not going to come to you to solve problems if they don’t see you as someone who solves problems. If all you have are photos on your site, they’ll think that’s all you do. You’re not telling a story or explaining the problems you’ve solved, so you can’t expect clients to come to you with their problems to solve. 1:05:41 Justin: I did things a little differently, I showed initiative with writing the CSS for the Fluid App for the old chat. No one asked me to do that, I just did it, and it demonstrated initiative to you. Then, when we did the relatively small project of the iOS App, it demonstrated to you that I could do exceptional work. You have to demonstrate your abilities—through case studies, writing, showing initiative—to establish trust, or there’s no reason for them to value what you do. 1:06:28 Sean: You have to do that. You didn’t get paid to do that little project that showed initiative. You won’t get paid to do case studies, personal projects, or pro-bono work. People ask, “What if you don’t have clients banging down your door? What if the kind of clients you want to work with aren’t yet coming to you?” That’s why we have the Overlap Technique. You have to have diversified sources of income. You can’t be operating out of a Scarcity Mindset. You need to allow your professionalism to grow organically, otherwise you will compromise on your professionalism to pay bills. 1:07:08 You don’t want to attract the wrong clients. You want to attract the people that want to pay you for value. If clients aren’t knocking on your door, that doesn’t mean you should go chasing them. Chasing clients is bad, you want to attract clients to you. Robert Cialdini talks about the The Rule of Reciprocity in his book, Influence, which is about the psychology that can be applied to marketing. The Rule of Reciprocity means if you give someone a gift, they feel compelled to return the favor. When you chase clients, it’s perceived as asking the client for the favor of working with you. If the client accepts that, you owe them and sets the whole project off on the wrong foot. You want to attract the right type of clients. If clients aren’t knocking on your door, it means you aren’t attracting them. The way to attract them is through your case studies, your writing, and demonstrating your problem solving abilities. 1:08:32 The reality is that clients don’t care about how much something costs. It seems like they do but when you dig deeper they really don’t. Clients care about their problems. They’re not focused on cost until you bring it up. That might be hard to stomach if up until now, you’ve been asking clients for budgets. You might forget you’re the one asking about a budget and think, “Clients always want to talk about money. In fact, that’s all they want to talk about!” They’re talking about it because it’s the first question on your form! You brought it up. They don’t care about cost, they care about how much value they’re receiving. If you were to solve a problem for a client that would generate $100,000 worth of revenue in the next week and you charge them $20,000 for it, they’d think that was great and say, “Where can I sign?” They’re not focused on the price, they’re focused on getting $100,000. Your clients don’t care how much your competitors charge until you position yourself in a way that opens you to comparison. Clients purchase on perceived value—you need to price accordingly. 1:10:22 Justin: Clients have problems and they want solutions to those problems. As long as the value they get out of that solution is greater than the amount they spend to solve it, they’ll be on board. Especially, if you ask great questions and have a track record of doing exceptional work. People think writing case studies is wasted time—they think they should be doing something that makes them money, but you have to look at creating case studies and showing initiative as investments. They’re investments in yourself, your long-term future, and your relationships with clients going forward. Case studies are so important and you can’t look at them as a chore. They benefit you greatly in the long-run. 1:11:42 Sean: Invest in yourself—that’s totally true. When you price as a professional, clients will come to you for solutions. When you price at an hourly rate, clients see you as someone who performs a task. Justin has established himself as someone who will help me solve the right problems and create value, so I’ll go back to him. I’m going to go back to him because he gave me solutions, not because his rate was better than the market rate. I don’t even care about that. When you price on value, clients see you as someone who’s on their team. 1:12:31 That means in the future, they’ll come back to you for more solutions. Case studies are very much an investment in yourself because you’re setting yourself up to get more of the same kind of work from the right type of clients. Justin and I have been working together for half a year now and we’ve got another half a year’s worth of projects lined up because I want to keep giving them to him. You might think you need to bring in a lot of clients and not ask too many questions on your website so as not to deter them, but the reality is: you don’t need a lot of clients. You need a few of the right type of client that will keep coming back to you and who will refer others to you. 1:13:22 Justin: You can’t be afraid to say no to the wrong people. If you say yes to the wrong clients and start working on those projects, then you’ll never find the right ones. You’ll be too busy working on the wrong ones.